The Justice Department intends to drop manslaughter and weapons charges against one of the Blackwater Worldwide security guards involved in a deadly 2007 Baghdad shooting, prosecutors said in court documents Friday. The shooting in busy Nisoor Square left 17 Iraqis dead and inflamed anti-American sentiment abroad. It touched off a string of investigations that ultimately led the State Department to cancel the company's lucrative contract to guard diplomats in Iraq. Iraqis have said they're watching closely to see how the U.S. judicial system handles the five men accused of unleashing an unprovoked attack on civilians with machine guns and grenades. A one-paragraph notice filed Friday says only that prosecutors have asked that the case against Nicholas Slatten of Sparta, Tenn., be dropped. The government's detailed request to the court was filed with the judge and with the defendant, but was not made public. Prosecutors filed the request in a way that allows them to file new charges against Slatten later. There is no indication in the documents whether they intend to. Justice Department spokesman Dean Boyd said Friday he could not say whether new charges would be filed. Slatten's attorney, Thomas Connolly, said he could not comment on the court documents but said Slatten has maintained his innocence all along. Slatten was an Army sniper who served two tours in Iraq before joining Blackwater. The request could be a bad sign for the government. After the shootings, some guards spoke to investigators under the promise of immunity. Prosecutors have been arguing behind closed doors that the immunity deal did not taint the case. The judge is considering that issue now. Jury selection in the trial is scheduled to begin Jan. 25. Five guards, all military veterans, face charges. 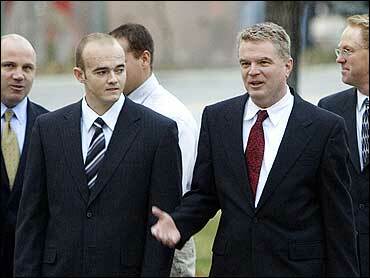 Prosecutors say the shooting was unprovoked but Blackwater says its convoy was ambushed. A sixth pleaded guilty, turned on his former colleagues, and pleaded guilty to killing one Iraqi and wounding another. The case against the remaining four guards is set for trial in February. Prosecutors were aggressive in their charges, using an anti-machine gun law to attach 30-year mandatory prison sentences to the case. And though authorities can't say for sure exactly which guards shot which victims, all five guards are charged with 14 counts of manslaughter. So far, most of the case has played out behind closed doors. Defense attorneys have argued the FBI improperly built their case using information gathered under the promise of immunity. Investigators say they were careful to build their case only on material gathered independent of the immunity deals. The trial likely will hinge on whether the Blackwater guards were provoked. Iraqi witnesses say Blackwater fired the only shots. Some members of the Blackwater convoy said they saw gunfire. Others said they didn't. Radio logs of the shooting indicate the guards were fired on. Prosecutors say the guards were itching for a fight and unleashed a gruesome attack on unarmed Iraqis, including women, children and people trying to escape. The convoy allegedly launched a grenade into a nearby girls' school. Since the shooting, Blackwater, headquartered in Moyock, N.C., has renamed itself Xe Corp. and has undergone a management upheaval.